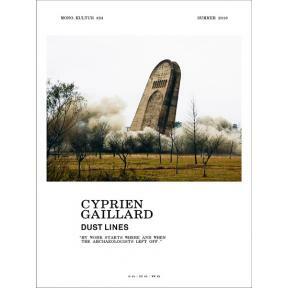 Fire extinguishers being launched in romantic landscape settings, the demolition of housing estates, fighting youth gangs in St. Petersburg – these are some of the subjects examined by Cyprien Gaillard. Emerging as one of the most promising talents among a new generation of young artists, Gaillard is concerned with contemporary land- and cityscapes and the effects of architecture and time on our lives. Gaillard celebrates the complexity and the unresolved contradictions of the modern world in a hugely varied body of work, ranging from film to sculpture, from collage to large scale interventions. But underneath always lies a certain awe for the beauty of our flawed environment. His work has been exhibited at major institutions such as the MoMA and New Museum in New York, Kunsthalle Basel and the Hayward Gallery in London. With mono.kultur, Cyprien Gaillard talked about the failure of modernism, land art as a form of vandalism and why Cancún has never been as beautiful as now. ‘In order to make something beautiful you’ve got to destroy it,’ Gaillard told us during the interview, so we took this paradox to heart by leaving the pages of the issue untrimmed, turning it into an object that needs to be damaged in order to be fully enjoyed. Oh, and did we mention that it includes nearly 50 images, many of which stem from the private archives of Gaillard and have never been published before?